You don’t have to be sitting in front of your computer to be effective in your job search. Expand your basic Internet searching to maximize the chances of positive outcome from your efforts. Using only traditional job posting sites is unlikely to produce the results you want. Many companies are conserving their bottom line by using free online options to find and screen applicants. Expand your options and go beyond basic job search tactics by leveraging the many available mobile technologies. Most hiring managers are likely to start with a basic search of a candidate’s name, sometimes even before reviewing the resume. Google yourself to see what potential employers will find even before you start sending out your resume or posting to online sites. Clean up your act on Facebook or any other social networking sites to be sure your social life doesn’t sabotage your job search! You want to be prepared by knowing what employers are going to find about you online. If the hiring manager’s initial online search of you yields poor results or presents an unprofessional image, your stellar resume and accomplishments may not make any difference. LinkedIn and craigslist are just two examples of existing sites that employers may turn to in reducing the costs of their search for job candidates. To be effective in your job search, you want to cover all the bases. 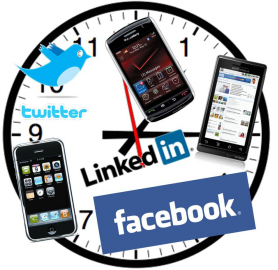 Include traditional social networking sites as well as professional organizations to maximize your results. Be sure to take advantage of all features on the sites you do choose to use. Facebook offers a professional profile feature to which you can post your resume. LinkedIn allows you to include key aspects of your work history as well as the areas in which you are currently focusing your job search. You can also retrieve important contact information about companies in which you have an interest through their Facebook or Twitter accounts. Personalize any contact with the company to increase the chances that your emails will be opened and that your application reaches the right person when using traditional mail services. Don’t set aside your job search because you are away from the computer. Not only can you use the Internet on your smartphone to monitor your job search while on the go, but you can also get job alerts sent to you in real time by setting up your dedicated job search email account on your phone. You can respond immediately which will convey your interest in the position and your responsiveness as a potential employee. Be certain to set up apps to track position openings through major job search sites. Staying connected can reduce your search time while expanding networking opportunities. By following companies of interest on Twitter or Facebook, you also stay on top of changes that help you be a prepared and well-informed job candidate. Podcasts can be a great resource in your job search. Not only can you listen for career advice, but you can also learn about job openings as more employers are using podcasts to advertise openings or air interviews from current staff. You can create your own podcasts to build your personal brand. Typical content might include your elevator speech, descriptions of key accomplishments, or successful projects completed. You can check out existing podcasts or post your own on sites such as iTunes. Following corporate blogs helps you understand the company culture and important areas that you can emphasize in your contacts with key staff or during the interview. Career-related blogs may also give you tips about hiring. Look for industry trends reported in blogs that you can apply to your job search. Blogs may also be used to showcase your accomplishments. Staying connected makes it more likely that you will not miss that all-important request for an interview. In addition, your knowledge of the industry gives you the ability to respond quickly to new openings or by following up on your resume with targeted information about your value to the employer. Going mobile may just help you stay ahead of the competition!